App400: "To sum it up, if you wish to edit and manage Windows files on your iOS device, then Documents is the perfect app for this." Documents now supports tabs with the ability to edit and view multiple files at the same time. Documents is the ONLY Word editor that allows you to open multiple files. Edit, organize, and access Microsoft Word documents right on your iOS device without ever sacrificing formatting or the look & feel of the real thing with Documents! This is not just like any other Word processor; it also has a full “PDF Annotator & Forms” where you can easily fill PDF forms, annotate PDFs, highlight texts, sign and stamp PDFs, add bookmarks and notes, or draw with your own finger. You can also access and manage other file types regardless of whether they’re stored locally or remotely too, & do it all from anywhere! Documents delivers it all at the lowest price! Both .docx and classic .doc formats are fully supported and best of all – every Word document you make, save, and edit in Documents retains its original formatting regardless of being opened or closed. o Text formatting options including – Bold, Italics, Underlined, and Strikethrough features in addition to Superscript & Subscript formatting. o The freedom to choose text alignment – Right, Left, Centered, or Justified. o Line and Paragraph spacing options. o Font background & typeface color options. o Support for tables viewing. o View headers and footers with different page margins, layouts and sizes. o Print your word documents via Air-print. o Email and open your documents in other apps. o Manage and view images, videos, music, PDFs, MS Office documents and other file formats. o Zip & Unzip almost any document types. 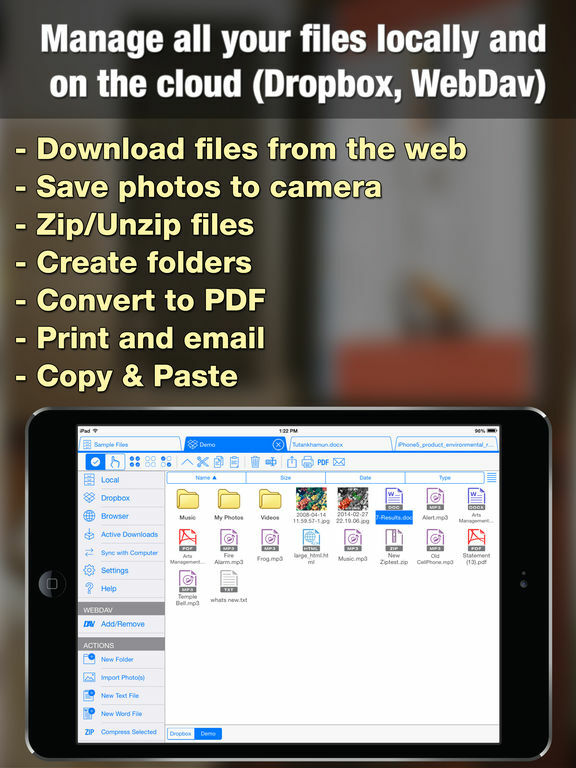 o Access & utilize the app’s included multi-file downloading program. o Open almost any file as a text document. Documents includes a powerful PDF annotator and form filling as well! o Fill and sign PDF forms and government documents. o Take notes and add your comments at ease. o Mark up important text in articles, magazines and journals using the Highlight, underline and strike-through tools. o Add Text fields for more clarifications and notes to your readings. o Use the free hand drawing tool to draw with your finger or stylus to add hand written notes and marks. o Draw squares, ovals, lines and arrows with simple taps and control there color border and size. o Manage add bookmarks for your future reading. o Sign and stamp any document and flatten it before emailing or sharing. o View pages, outlines and bookmarks for easy navigation through the document. A powerful photo editor with lots of features. Apply advanced effects, add text, stickers and smileys to your photos. You can also get a professional photo look with the great photo effects availabe. Documents is developed by Beleela.